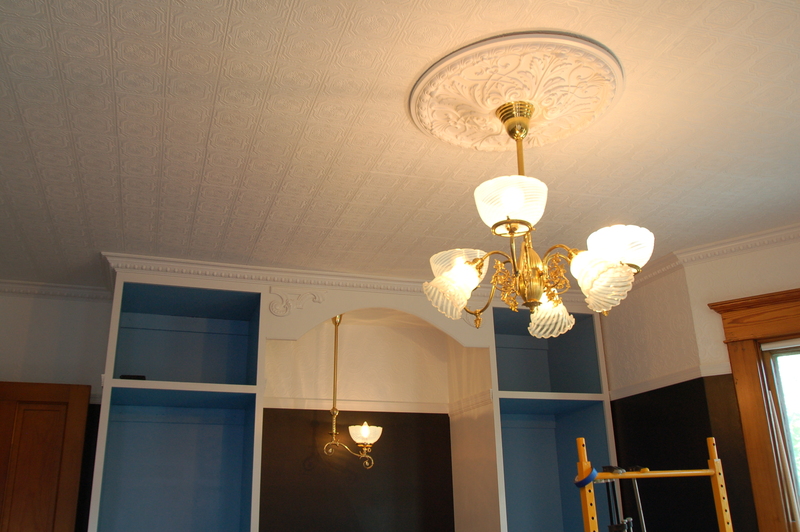 Vivacious Victorian: My Favorite Part. 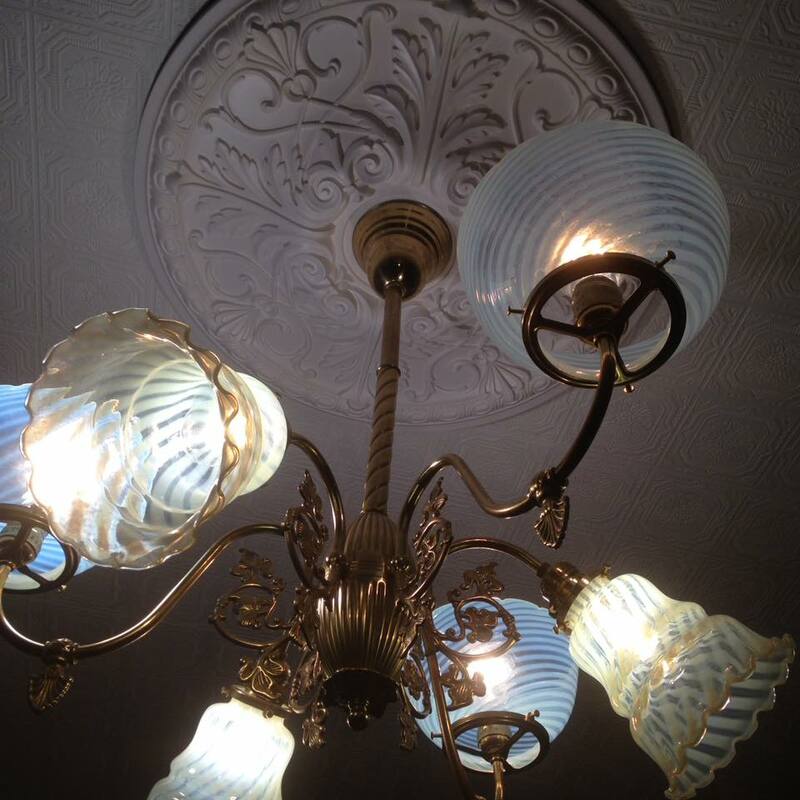 I have a love affair with vintage and antique lighting. 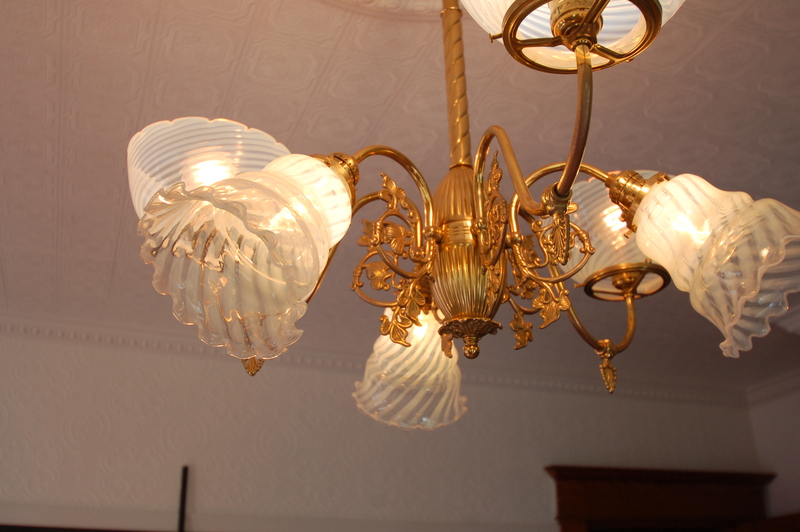 And chandeliers. 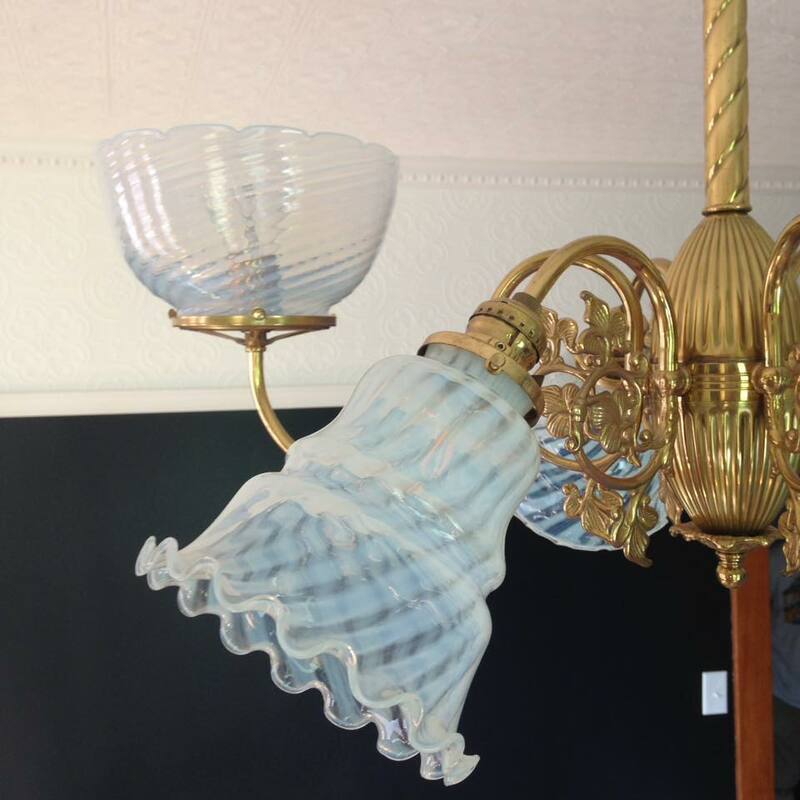 So much so, that we’ve started restoring pieces to sell, because we’ve picked up (hoarded) more light fixtures than our house can hold. 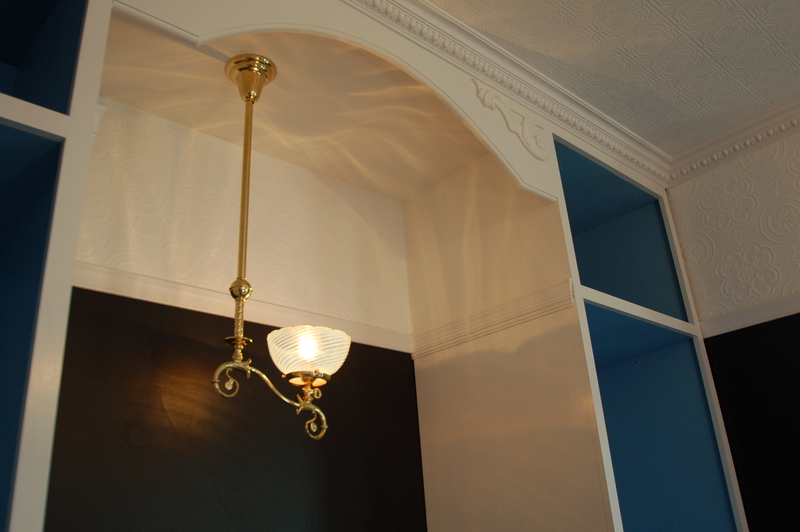 I truly believe that nothing makes an old house feel authentic more than lighting. It really is the soul of a room to me. 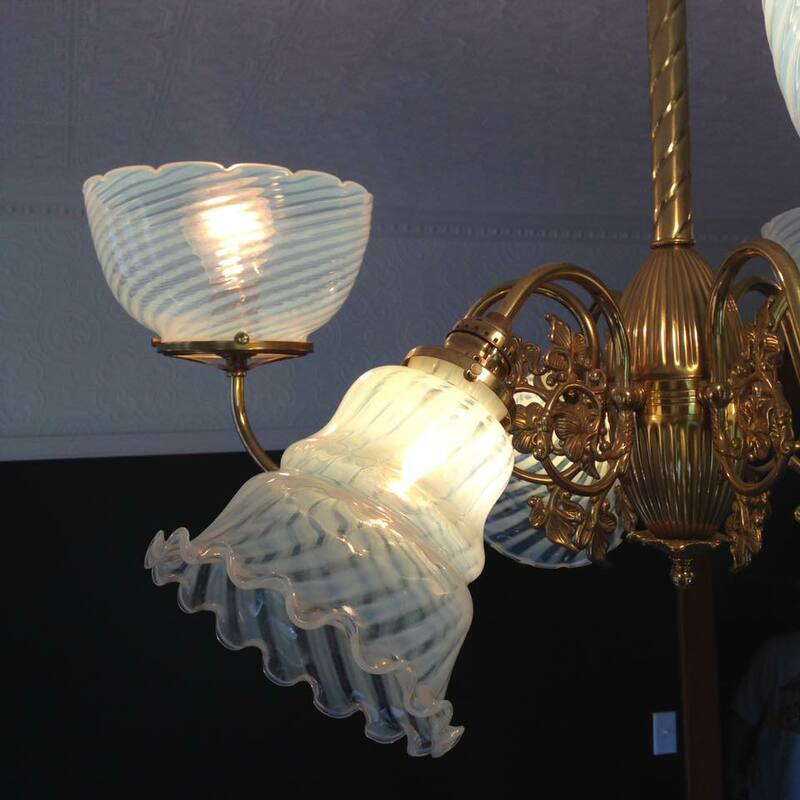 Part of me is sad that our last two houses had NO original lights left in them, but another part of me loves the thrill of finding pieces that are perfect and that make us both smile. You know what didn’t make me smile? 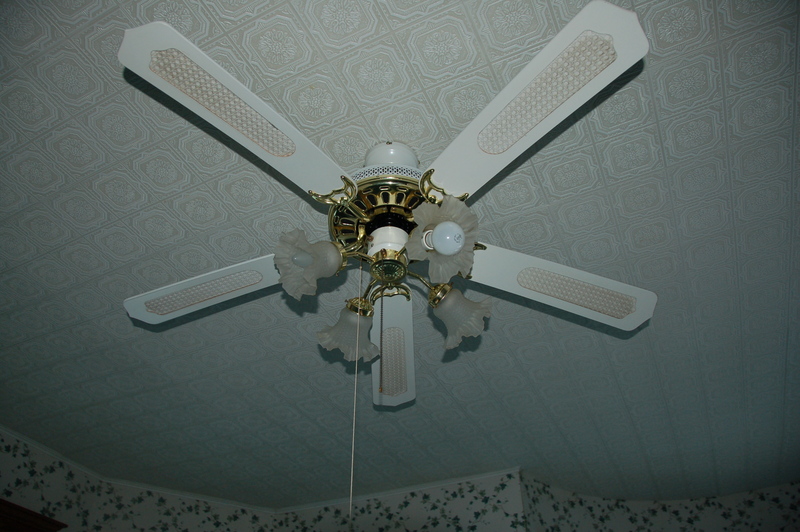 The ceiling fan in the front bedroom when we bought the house. 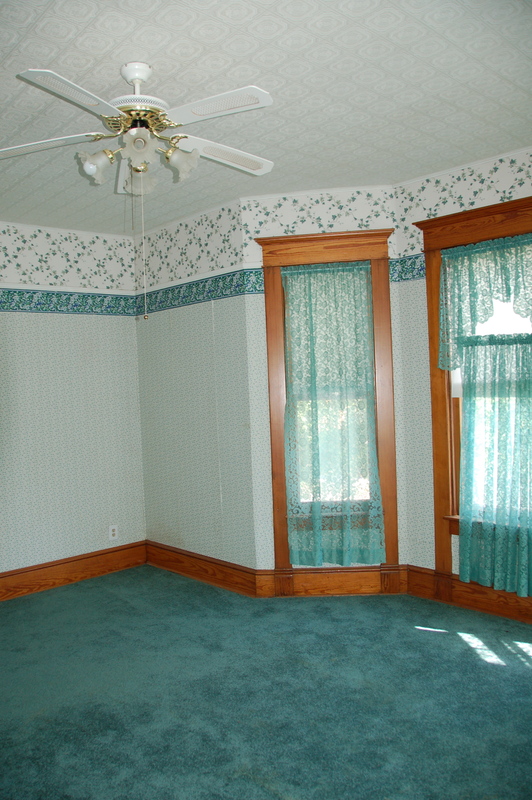 In this picture, I hate the ceiling fan the most, the carpet second, and the wallpaper third. 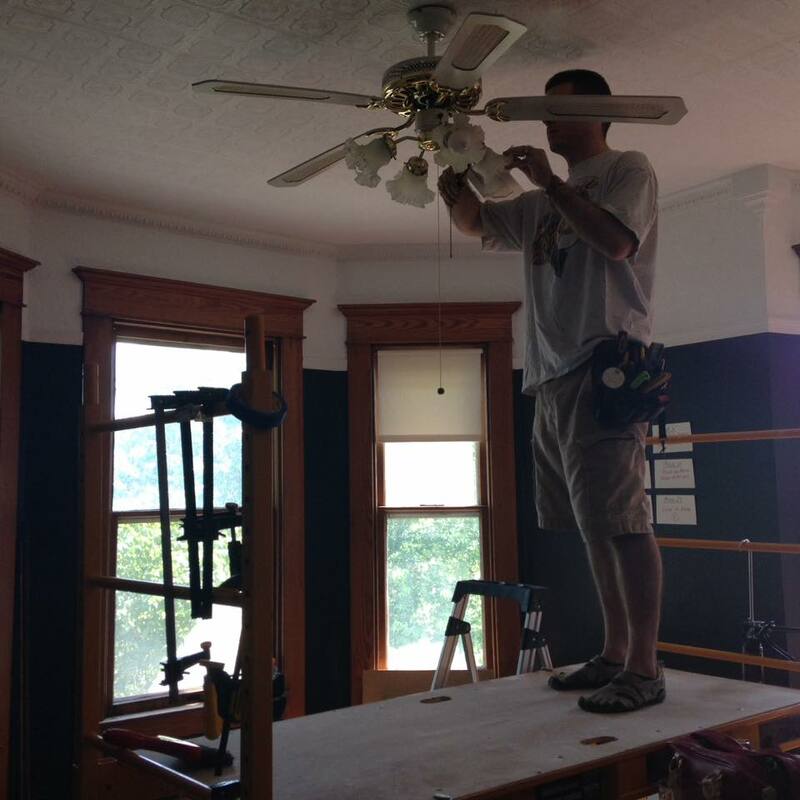 Ceiling fans are practical. That’s about all they have going for them. 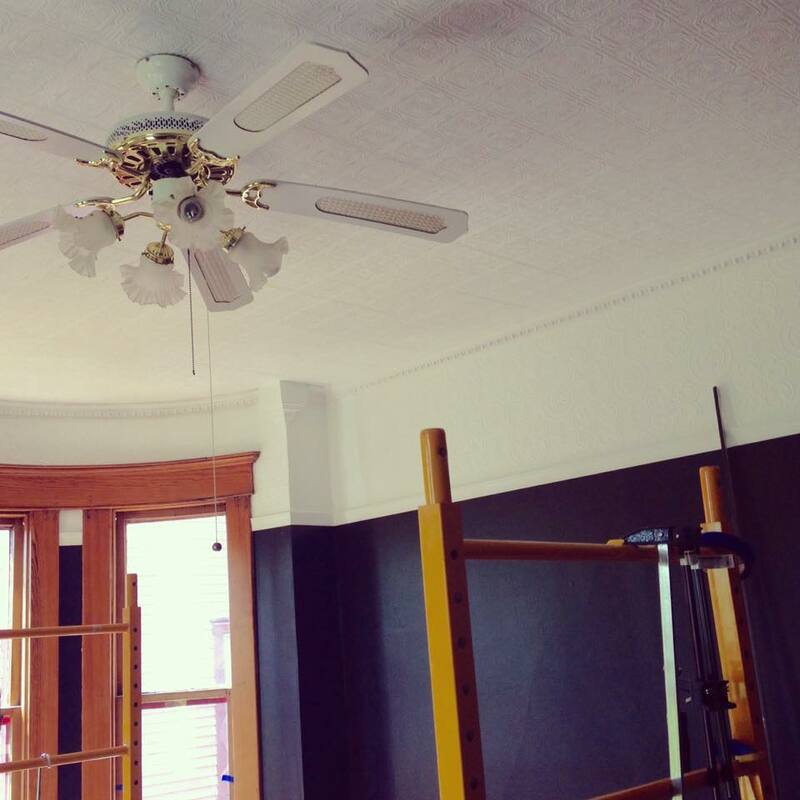 Sometimes I have people who sheepishly tell me, “I’m putting a ceiling fan in my bedroom,” because they know I hate them, but I don’t hate them in YOUR house! They are super practical, and I get why people want them, and I won’t shame you if you have one. 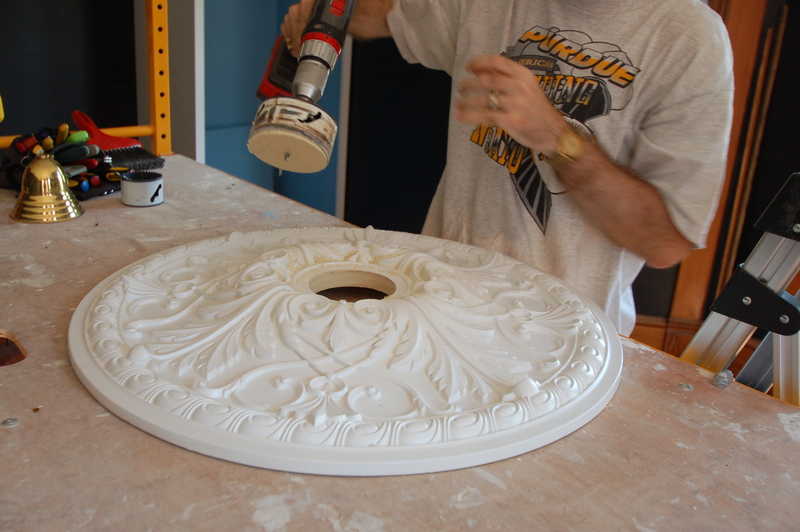 There are (of course) a zillion ideas on pinterest for making ceiling fans prettier. But my favorite way to make them prettier is to eliminate them. 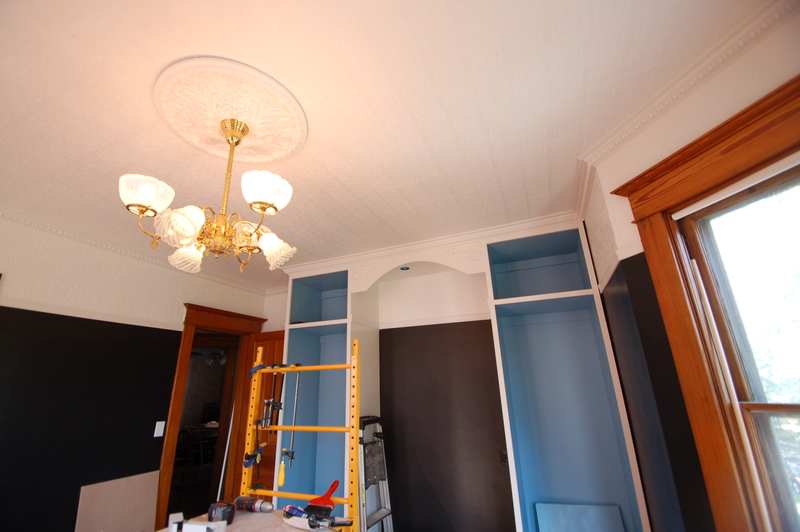 Somehow, even changing the walls and painting the ceiling didn’t help. At all. 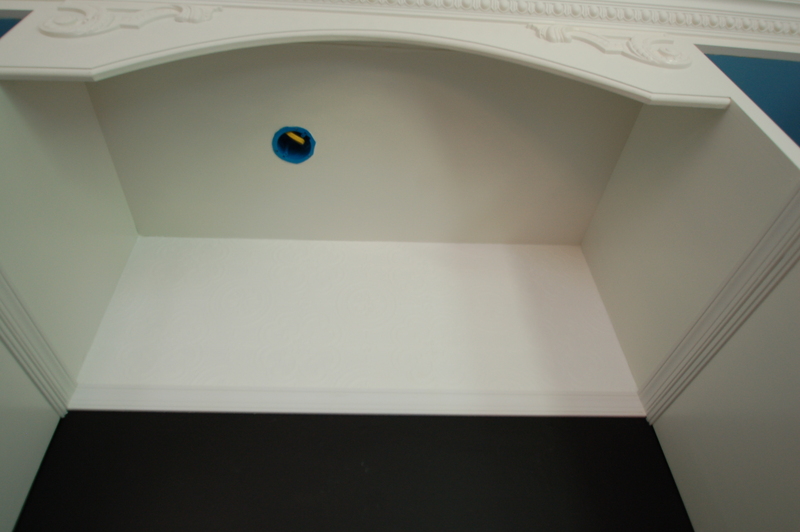 You know who liked this ceiling fan? Lady bugs. These shades, apparently, are the most glorious way to die. (Also these have been here forever. I never bothered cleaning these, because I’m a terrible person). 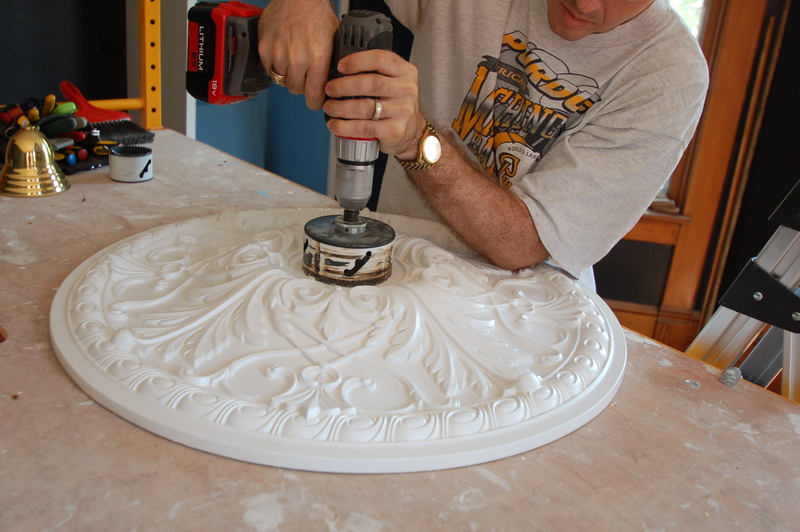 One of my favorite posts I’ve ever written is “The Twelve Steps of Renovation,” and I’m SO EXCITED that we’re to Number 10!!! So what’s going up? 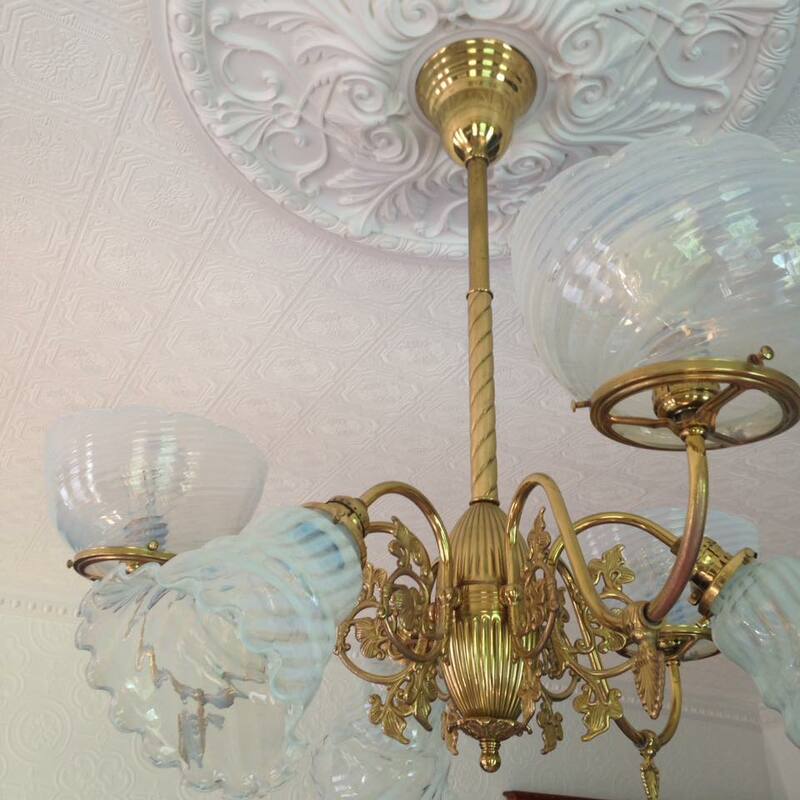 I found a fantastic light fixture almost two years ago at Madison Street Salvage. I LOVED it. 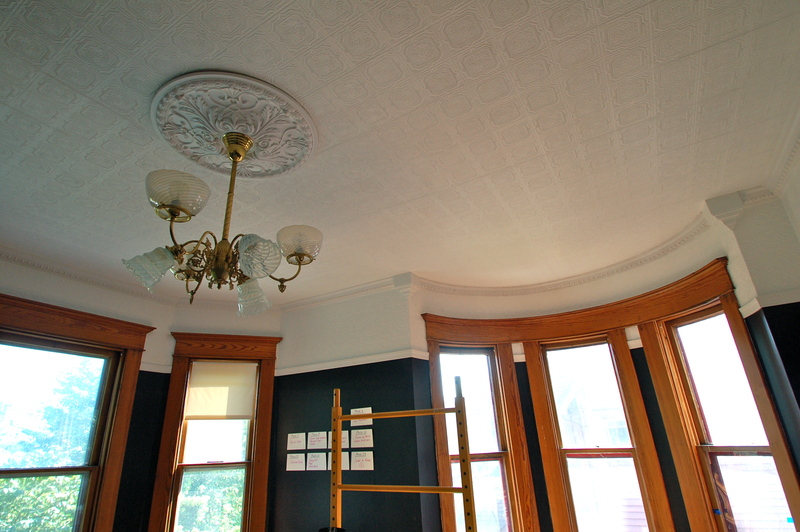 And it came out of a house that was right around the corner from us (which makes me sad for that house, but I’m excited that it gets a new life in ours). 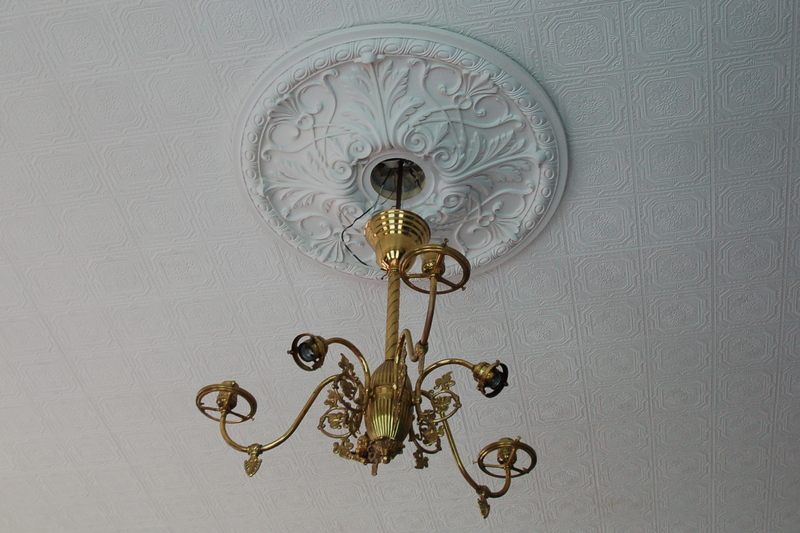 A converted gas and electric fixture with six arms – but it had no shades. 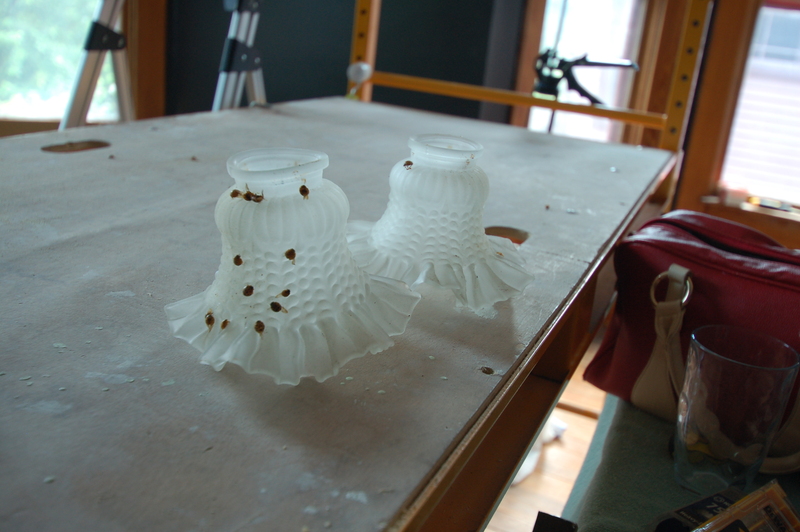 Shades for gas and electric fixtures are hard for me, because most of them are etched and lacy and frilly (which is not me at all). Or, they’re cranberry colored – which I actually like, but I just didn’t feel like that would work in the bedroom. Check out what I mean here. Somewhere along the line I saw some opalescent shades online, and I fell in love. Now, to find six of them! 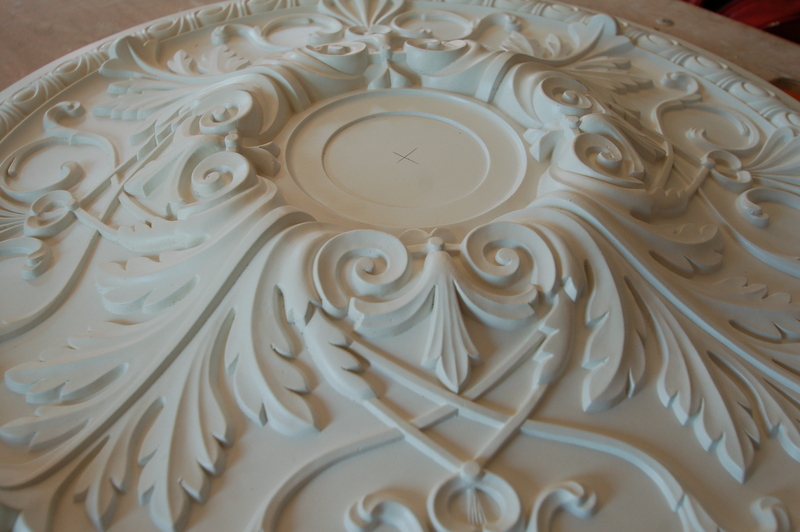 That was really, really hard – and ended up being the splurge for the room. It was just something that I couldn’t compromise on. 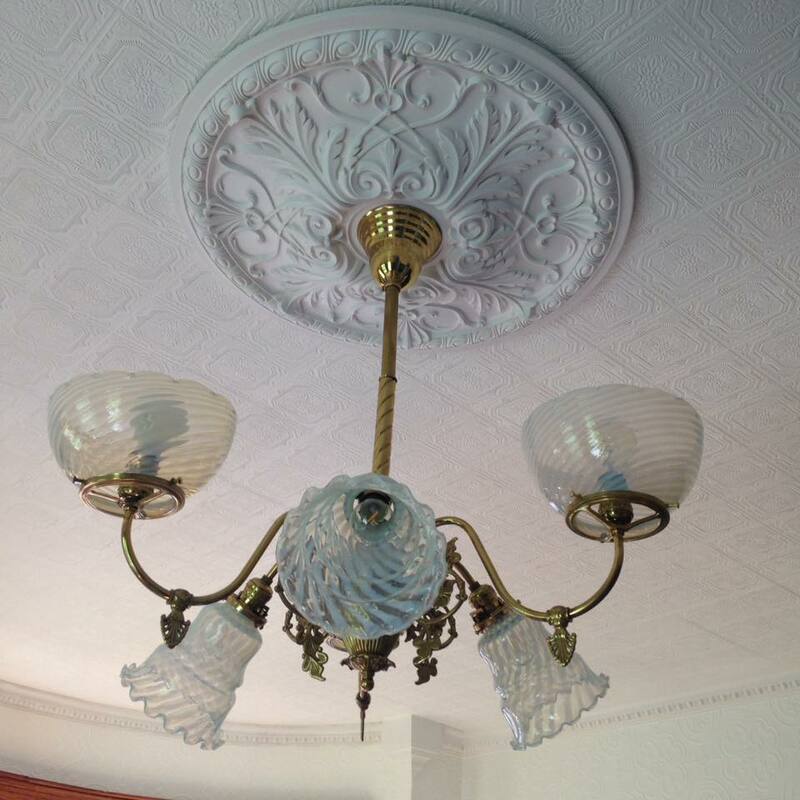 I found a set of four gas fitters on eBay from an antique lighting store in Cambridge, Mass. I emailed the proprietor and asked him if he would split the set and send me three, and he said no. Doug said, “I know you’re trying to save money, but having an extra shade will be good, in case one of them breaks.” HE IS SO PRACTICAL. So I ordered them. Then I set out to find a set of electric shades. I found them! In Peru! Peru, Indiana? Nope. Peru the country. Bring it on. The shades have been sitting protected in another room for quite some time. 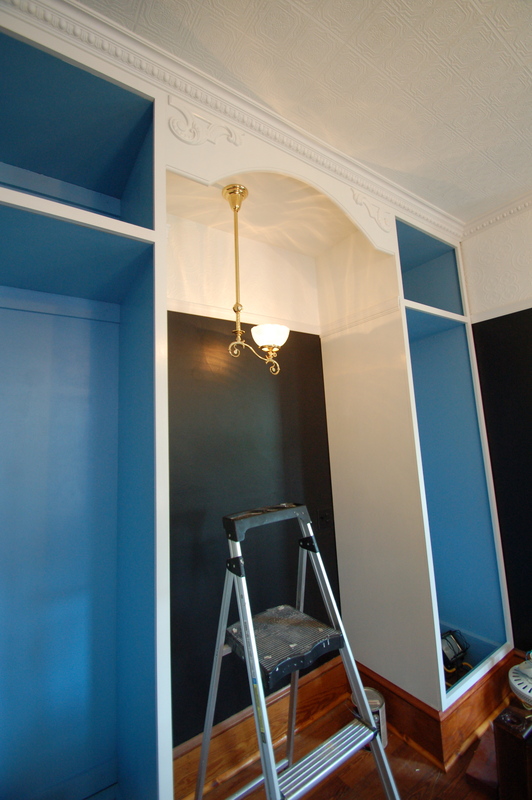 And when I decided to design a wardrobe for the room, I made use of the extra shade we had – by designing a single fixture in the center of the wardrobe! 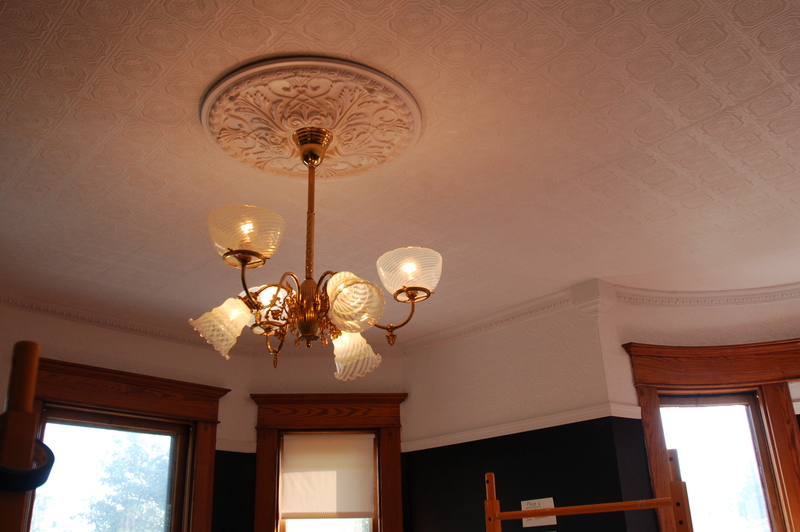 I found a great reproduction light at Victorian Lighting Works that really complemented the fixture we had for the center of the room. 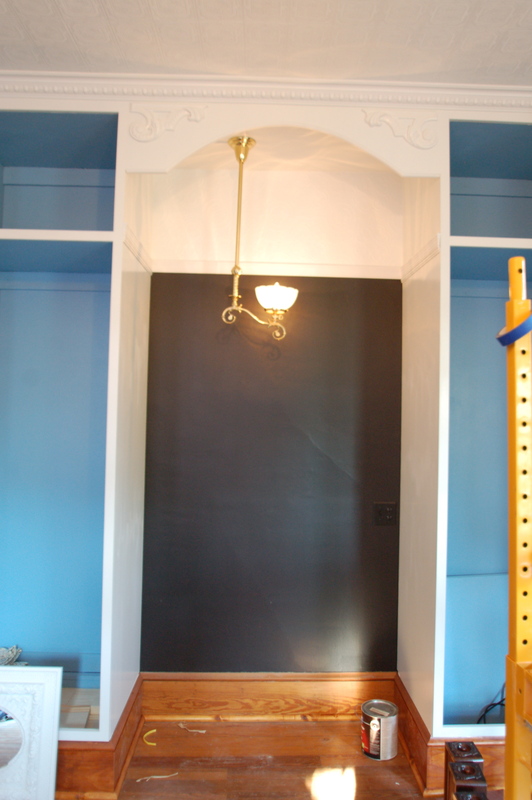 We decided the shade would be centered on the wardrobe, so the electrical box is offset. 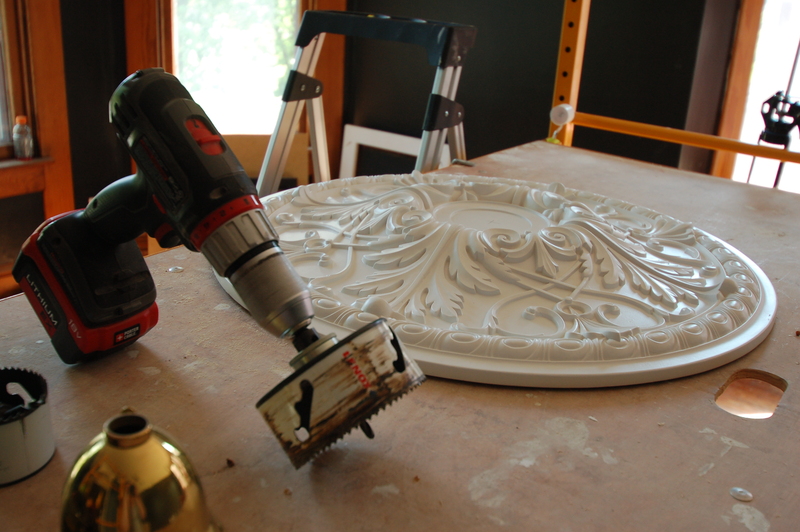 For the center fixture, we added a ceiling medallion. For the first time in my life, I didn’t hand paint it, or even paint it a different color. 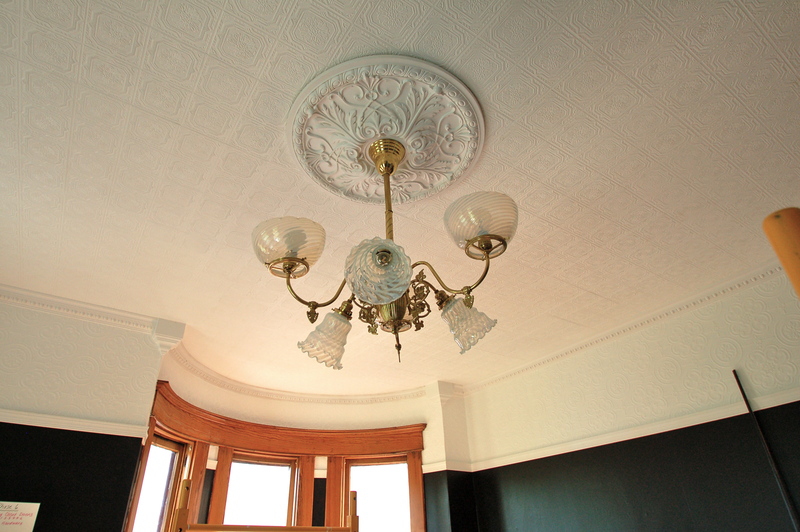 It’s staying all white, to be seamless with the ceiling. It feels so weird to do that, but it’s perfect. 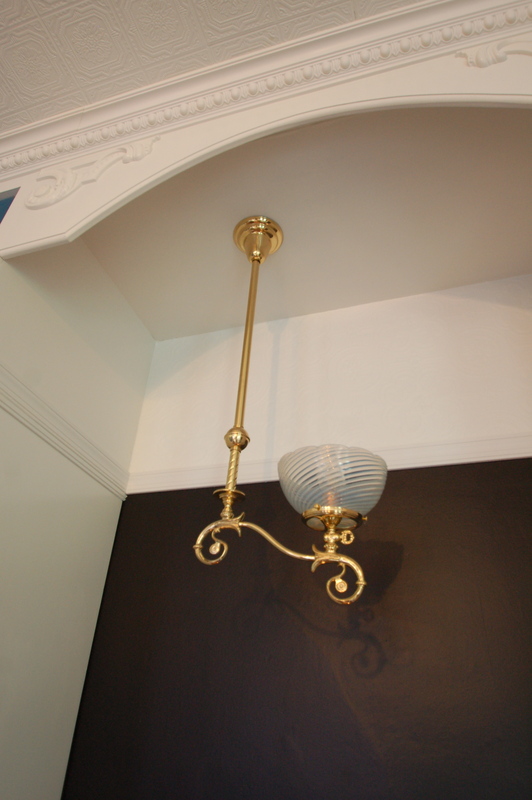 After the medallion went up, the fixture went up. 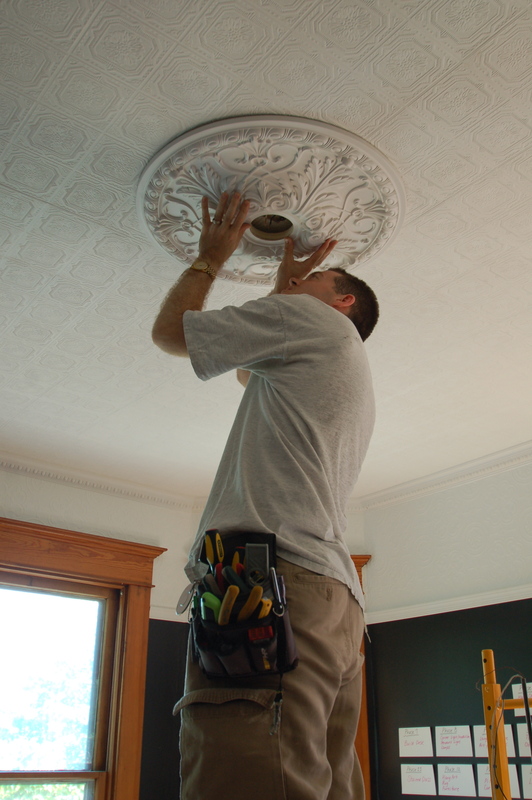 I’m always nervous when I get a fixture that it’s going to be too large, and then I never remember how small things look on 10′ ceilings. It’s a pretty perfect size. Cambridge on the Top, Peru on the Bottom. Thank you, eBay. I love this little pendant way more than I thought I would. It’s so fun! 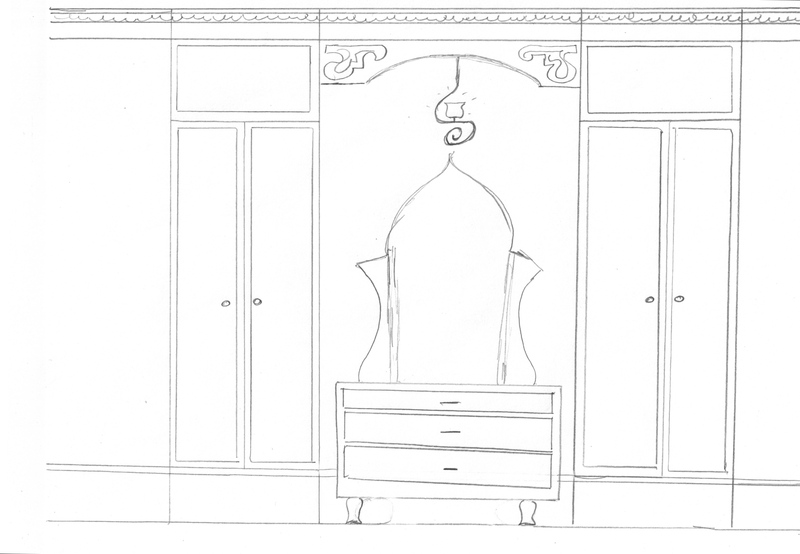 There will be an antique dresser between the two wardrobe towers. Both together! I’m really so excited. If you couldn’t tell. Hi there! I love that you’ve linked to this post – thank you! Can you please attribute to vivaciousvicorian.com? Thanks so much! Your website link has been added … let us know if there are others in the future. We share some of our fav sites via RSS feed automatically.